I just got back from a 6 day hike that took me through a variety of rugged mountain terrain up to a high long ridge above a cirque lake..........Sounds very much like all the others I guess. It is an exercise in route finding through gnarly,prickly patches of dense devils club,vine maple and alder which open up to steep ancient patches of Fir and cedar trees .Deer have been navigating these hills for centuries so I follow their trails although sometimes they will dip under huge logs or over steep gullies not suited to the humble biped.Last fall I got up to Swan lake but the snow line was low making the ridge slippery.On that trip I lost my toque along the way and had to wrap my head up with an extra sweater with a ' mother Hubbard' look. I was happy to find it the other day almost a year later among the twists and turns up a steep tree-covered slope awaiting my return.I quickly grabbed it as if some how if I turned away for a moment it would vanish. After making camp at the high lake on my 51st birthday I marked a route up to the ridge for the next day.It is still a few km's to the peak and quite a trek to get back out so I took a rest day to pace myself properly.Drank lots water and tried to find a cool place to rest but still be covered up from the insects.Above the tree line it opens up to patches of heather and lichen covering the rocks.The mosquitoes,black flies,no-see-ums,deer flies and horse flies would present a constant 'distraction' if not for my cherished bug net.The other day I was napping along a high ridge sitting against a big rock when I woke to a clatter of rocks a few meters away as a deer scrambled off having almost walked right beside me. It takes most of two days to get back. Down the steep Swan river canyon with several waterfalls and trees growing on impossibly steep moss-covered slopes down,down,down to where it empties into Silverhope creek to the Fraser river and Pacific ocean.I walked along the rocks and floodplains covered with dense willow shrubs and piles of huge trees felled in storms gone by. In the more stable areas there are huge old water-guzzling cottonwood trees concealing enormous cedar stumps from the first round of logging. Night 6 found me sleeping comfortably in my tiny tent with the rain cover off in a stand of cedars with the constant roar of the creek [river] accented by the longing buzz of mosquitoes unable to bypass tent security. My friend Chris picked me up the next morning completing another safe round into the hills.The great thing about this is activity is that it forces you to really live in the moment.There is nothing more important than the next footstep because a poor choice can change everything. Never trust a wet log.Step over,go around or crawl. The wet rock owes you nothing and the creek welcomes you at all times. 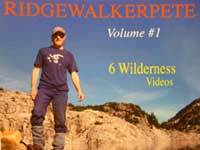 Really enjoyed your vids as I am into solo hiking like yourself.